(Trinidad Newsday) THE collapse of the David Granger-led government in Guyana after a no-confidence motion could not happen in Trinidad & Tobago, because of the differences in the two countries’ political systems. 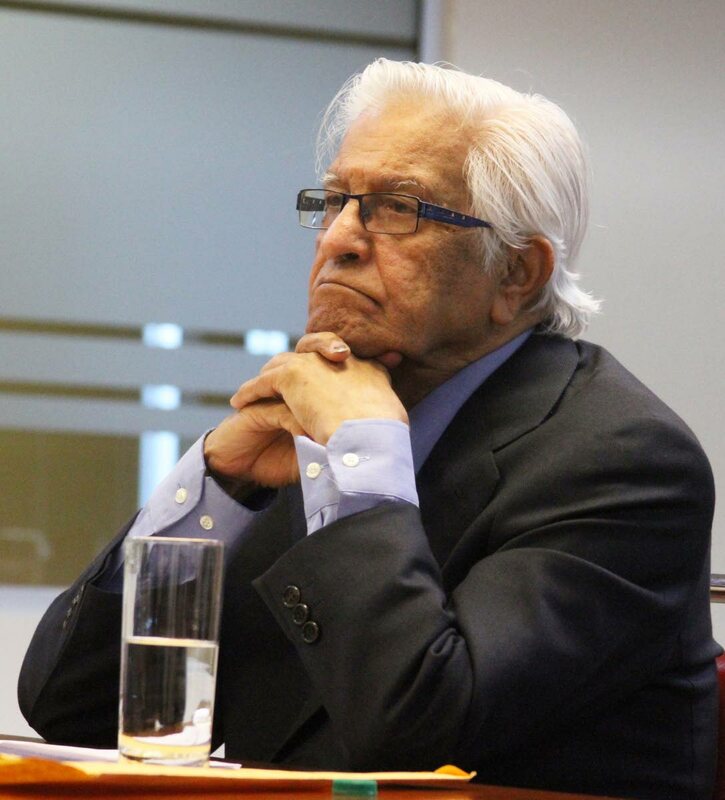 That’s the word from former prime minister Basdeo Panday, who, in a telephone interview yesterday, also predicted that elections due in 2019 and 2020 will witness the two main parties (the ruling PNM and the Opposition UNC) play “musical chairs” in Parliament, unless constitutional reform becomes a reality. Local government elections are due in 2019 and a general election in 2020. Panday predicted, “If there is no change in the political system, what will happen here will be a continuation of musical chairs in the Parliament, where either one of the racial groups or blocs will be in office. “It will be as simple as that. It has been happening for, what, 46 years, and will not change unless there is constitutional reform.” Panday said this was his message at a function hosted by Chaguanas West MP Ganga Singh in Chaguanas last week. “This is a call for people who are dissatisfied with the system to unite so that we can change the system.” Panday said he had not received any calls from any political party or individuals about his call for unity. Asked whether “unity” meant the formation of a new political party, he said, “Yes, it may mean that, yes.” He did not elaborate. On the collapse of the Granger government, Panday said the Guyanese constitution possessed “allowances” for those scenarios. “Democracy is at play, I guess, because whatever has happened has happened in accordance with their constitution, and their constitution has provided for this kind of change when people want change. TT had a dead-heat election result in 2001 – 18-18 – which was resolved when President Arthur NR Robinson selected PNM leader Patrick Manning as prime minister over the incumbent, Panday. However, the Parliament could not elect a Speaker, as the PNM did not have a majority, and fresh elections had to be called in October 2002. In 2007 the number of constituencies was increased to 41 to avoid a hung Parliament. There have been coalition governments, when the UNC combined in 1995 with the two NAR Tobago MPs, and the People’s Partnership coalition of 2010. Before debating in Parliament, local parties caucus to discuss a bill and reach agreement in advance on how they will vote, though there is a rudimentary “whip” system. In the original Westminister system the numerous whips ensure that MPs are either present for important votes or “paired” with opposition MPS who will also be absent. In a three-line whip, MPs must be present to vote along party lines. On some topics at Westminster a free vote is permitted. Last week UK Prime Minister Teresa May survived a no-confidence motion by 83 votes (there are 650 MPs at Westminster) over the plan to take Britain out of the European Union (“Brexit”). There were chaotic scenes in Guyana’s Parliament last Friday when what was supposed to be a routine defeat of the Opposition Peoples Progressive Party’s (PPP) no-confidence motion against the David Granger-led A Partnership for National Unity (APNU) government was turned on its head by govt back-bencher Charrandass Persaud. Persaud repeated at least four times that he was in favour of the motion when Speaker Dr Barton Scotland had the process restarted. The vote was then concluded and the no-confidence motion succeeded 33 to 32, meaning the government had fallen. The collapse comes at a particularly precarious time.with President David Granger and the chairman of the Guyana Elections Commission both being unwell.